Hotel Mare Pineta offers a sea view swimming pool, direct access to the private beach and a national and international restaurant. Upon request Hotel Mare Pineta offers to its guest assistance to organize tours and excursions, to discover the beauties of Southern Sardinia, between sea and mountain. Mare Pineta is located only 300 meters from Flamingo Hotel e Resort. Both hotels are under the same ownership and management. Going along a path and a wooden bridge, it is possible to reach the numerous services of Hotel Flamingo. The miniclub, the pitch and putt (inside Hotel Flamingo) and above all the wonderful entertainment offered by a young and funny team, will give your children the possibility to spend a pleasant holiday. A cheap 3-star hotel that becomes a Family Hotel on the sea to entertain your children. From 15th June 2016 to 15th September 2019. Our wellbeing centre Ippocampo (inside Hotel Flamingo) is situated at 300-metre walking distance and offers massages, hydrotherapeutic treatments, Jacuzzi, sauna, beauty treatments and other services for your relax and wellbeing. The equipped gym, the tennis court, the beach volley tournaments and the Zumba fitness and Aqua gym courses organized by the Hotel Flamingo, will give you the possibility to keep fit during the whole holiday. The staff of the hotel in collaboration with local companies experienced in organizing excursions and tours, will give you the possibility to discover Southern Sardinia. The private beach of Hotel Mare Pineta makes the hotel one of the few 3-star hotels on the sea in Sardinia. A sea view equipped swimming pool for your relaxing days at poolside. Miniclub for children over the age of 3 at about 500 meters from Mare Pineta, to have a holiday with your children within a stone’s throw from the sea. A wellbeing centre at about 300 meters from your room to spend a relaxing day. Mare Pineta Hotel offers to its guest the entertainment of Flamingo Hotel, free of charge. 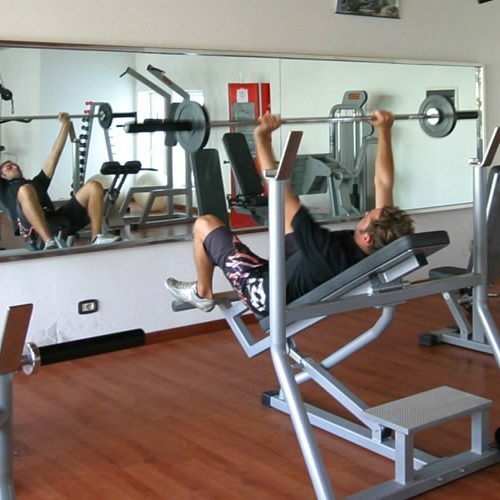 Zumba Fitness, Beach volley, Aqua Gym e and many other amusements at disposal of our guests.